During the post-war building boom in Scotland, from the 1950s onward, old housing stock seemed redundant and in many areas was demolished to make way for modern council housing. There were many derelict old buildings under threat in the East Neuk, where the decline of the fishing industry had encouraged locals to move away from traditional areas of habitation around the harbours, and many of the picturesque harbour frontages were becoming ruinous and unsafe. Planning laws were lax, ancient houses were allowed to fall into decay and were replaced by incongruous modern buildings of unsuitable design. Concerned individuals began to challenge local councils over their demolition policy, and organizations such as the National Trust for Scotland started to press for restoration rather than destruction. 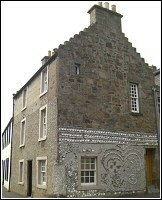 Interest in preservation and conservation was spearheaded by local architect, William Murray Jack of Cellardyke, who worked on the Historic Buildings Survey of Scotland to list buildings in Fife during the 1950s, and the Little Houses Improvement Scheme run by Hew Lorimer of Kellie Castle for the NTS. This scheme encouraged the purchase of derelict buildings by improving buyers who would renovate the properties. 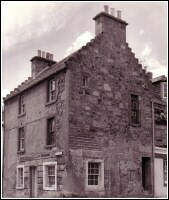 Many local buildings still bear plaques demonstrating their participation, such as the 17thc Chalmer’s Birthplace in Old Post Office Close in Anstruther, and 10 Virgin Square, St Monans; much of the harbour area and the Cribbs of St Monans were renovated in this way during the 1970s. 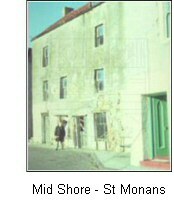 On the left is Kellie lodging in the 1960's and on the right is the Kellie Lodging as you would see it today. These responsible voices argued for the attractiveness of the vernacular architecture of the East Neuk, the rich architectural and historical heritage of our coastal burghs and rural villages, reflecting the old patterns of life, taking pride in local traditions, the evolution over time of the wynds, vennels and closes, and the individual character of the old stone houses with their pantile roofs, crow-step gables and distinctive lime harling. “ to preserve the architectural and historic character and atmosphere of the burghs and villages and the landward area and to improve and safeguard its amenities”. 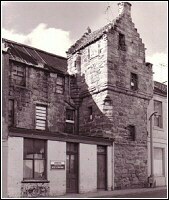 On the left is the Buckie House corner in Anstruther in the 1960's and on the right is the Buckie House corner as you would see it today. The Society at first bought up derelict properties, in Cellardyke, Pittenweem, St Monans, Arncroach and Anstruther, getting grants to restore them or selling them on to restoring owners. 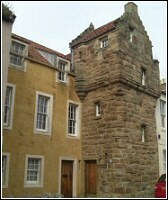 It also made contributions to other projects, such as the foundation and later expansion of the Scottish Fisheries Museum, restoration of the clock on St Nicholas’s Tower, Anstruther Wester, and restoration of the Priory in Pittenweem.